When it comes to mascara, I always look for one that promises to give volume. 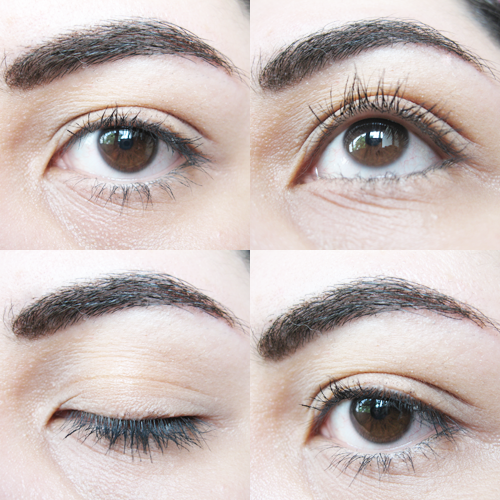 My lashes are naturally a little long already so I don't particularly need one that lengthens, and even if my lashes aren't thin either, I still prefer more volume over length because I love how it intensifies my eyes that way. 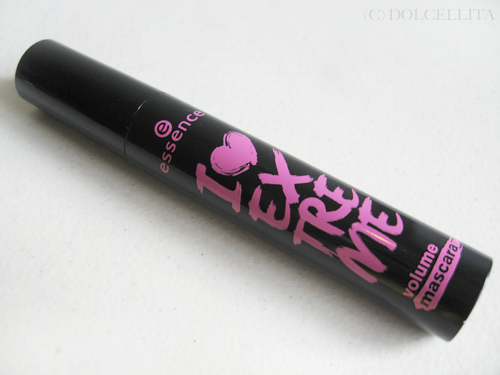 Though I still have my Lancôme Hypnôse Star mascara which I like, it's still not volumizing enough for me so I decided to try essence's I Love Extreme volume mascara. They have another variation, I just can't recall the name, but the SA told me this was better at giving volume anyway. 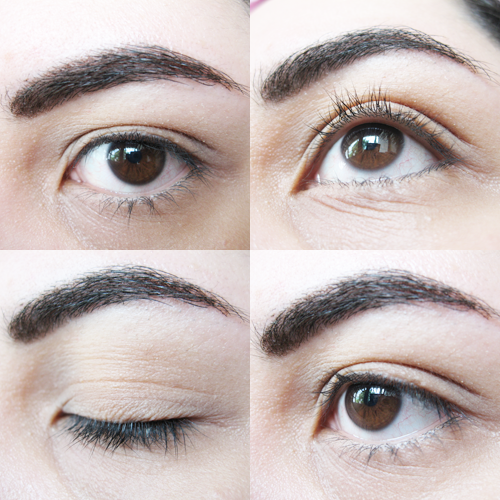 Mascara for extreme volume, ultra black, ophthalmologically tested. I like the color scheme of the packaging, especially since black and pink is one of my favorite color combinations. Nothing else special about the tube as it's fairly ordinary. The print/design doesn't seem the type to fade away too easily also, which is good. Kind of like the packaging itself, the mascara wand is quite typical or ordinary in appearance, but it is a little on the bigger side. It can easily pick up too much of the product though, maybe because of its size, which is the only downside for me. I think the pictures say all already. At a glance it didn't really give my lashes that much volume at all. At most, it gave it some length and a little volume, but that's about it. I only applied one coat also because this has one of those formulas that can very easily clump up your lashes, so you pretty much have to stop at one coat. I partially blame the large wand. The size of the applicator can also make application a little messy, especially if you're in a hurry like I was when taking these pictures. I find that I need a mascara shield sometimes when using this. Overall, this performs very much like my Lancôme Hypnôse Star (review here) except I can easily get 2-3 coats from the latter without much, if any, clumping. It's not very smudge or water proof either. I lightly rubbed my one eye earlier and it smudged along my lower lash line. It also ran and gave me slight panda eyes after I splashed some water on my face a few times. 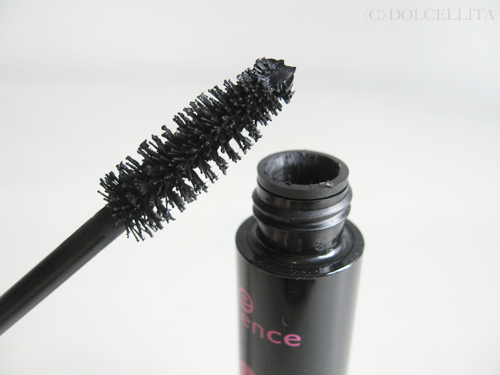 It does manage to hold the curl of your lashes quite decently though, I'll give it that. About five hours after applying, about half of the curl was still visible. Overall, this product is so-so. If you're looking for a budget-friendly mascara to just perk up your lashes and add some volume and length, then this'll most likely work for you - provided you're the kind that also remembers to not rub your eyes and you know you won't be doing any crying or won't get caught in the rain. I guess I can't complain too much though since this was less than Php200.00 or $5.